Chandeliers, whether they’re a treasured family heirloom or a newly purchased showpiece of delicate crystals, are a beautiful accessory to any home. For many, the idea of cleaning such an expensive and intricate centerpiece can seem like a daunting task. Often, chandeliers are difficult to reach, not to mention complicated to disassemble. There are two main options when it comes to keeping your chandeliers shining brightly—cleaning by hand or hiring a professional chandelier cleaner, the second option preferred by many. Taking on this task can be very difficult. Without the proper equipment, such as special ladders or hydraulic lifts to reach a tricky spot, your first challenge may be getting to the chandelier. If this is possible, you must be sure to have the proper padding to protect the surface below the chandelier and to prevent breakage from any crystals that may fall during assembly or disassembly. Never spray solutions directly onto a chandelier or use harsh cleaners. They can ruin the frame and cause corrosion. Cleaning by hand may seem like a less expensive option, but one that is very tedious, time-consuming and labor intensive. 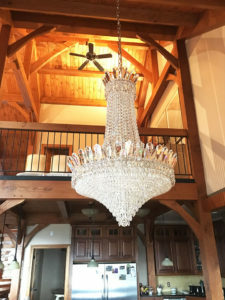 Professional chandelier cleaning services, such as Executive Chandelier Services, LLC, a professional chandelier cleaning service in the Pittsburgh area, specialize in the delicate and meticulous work involved with cleaning a chandelier. If you want to ensure you are protecting your investment, schedule a professional service at least once a year. With the help of a professional service, like Executive Chandelier Services, LLC, your chandeliers will once again shine brilliantly. Executive Chandelier’s premier chandelier cleaning service brings more than 20 years of experience in cleaning, installing and restoring all types of lighting in the Pittsburgh area. With their white-glove service, your chandelier will once again become the eye-catching centerpiece it was always meant to be. Reliable and highly skilled, no job is too big or small. For a free estimate, call 412-487-9219. The quality of work is exceptional — and the results are extraordinary.